The Pulmonary Trunk is about 5 cm long and originates from the upper part (infundibulum) of the right ventricle in the level of the sternal end of left 3rd costal cartilage. After arising from infundibulum in the middle mediastinum, it enters backwards and to the left and ends below the arch of aorta and in front of left principal bronchus by dividing into left and right pulmonary arteries. A. Sternal end of left 2nd intercostal space. B. Left lung and pleura. B. Commence of left coronary artery. C. Transverse sinus of pericardium. B.Origin of right coronary artery. Left and right pulmonary arteries. The right pulmonary artery is larger compared to the left and is located somewhat at a lower level. Different aspects of cardiopulmonary functions are monitored by the cardiologists by pulmonary artery catheterization. 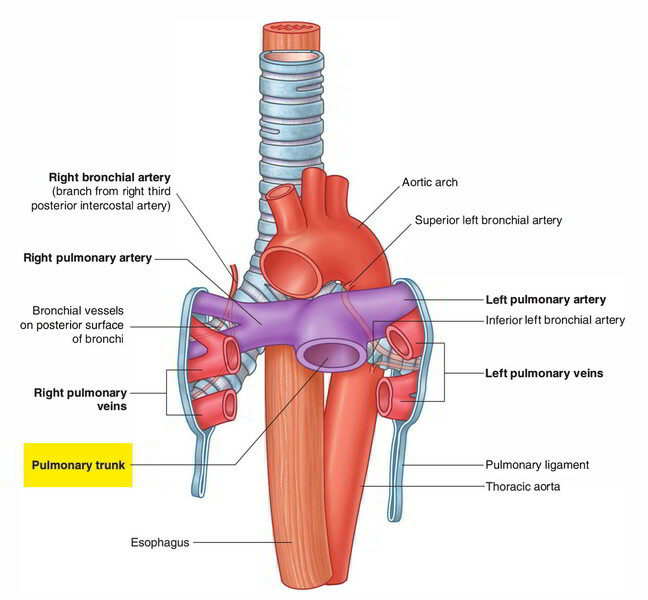 Internal jugular vein/subclavian vein ► Right atrium ► Right ventricle ► Pulmonary trunk ► Pulmonary artery. Sudden occlusion of pulmonary trunk by an embolus may be a sequel to the thrombosis of deep veins of the calf (viz. femoral vein) or large pelvic vein following operation or immobilization in the sick-bed. When the block is complete, death ensues rapidly.